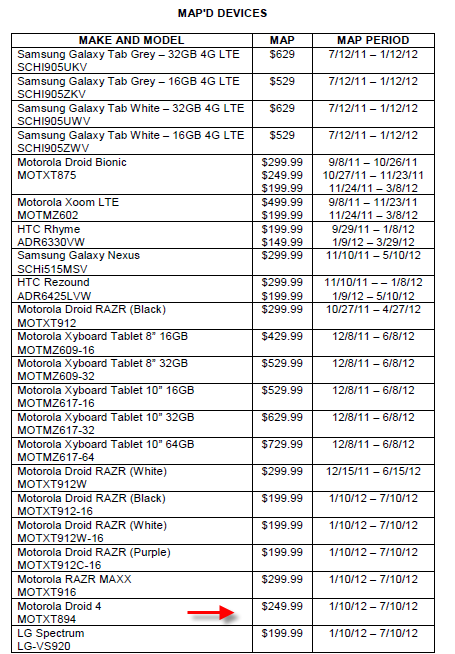 The folks at Droid Life got their hands on a leaked Verizon MAP (Minimum Advertised List) which shows prices for the newly announced Motorla Droid 4, RAZR MAXX and LG spectrum. Although, we know everything that has to do with features about the Droid 4, we haven’t been able to learn about its price or release date. Thanks to this MAP, you can now expect to shed $249.99 on contract for the D4 once it launches, whenever that is. We’ll also be posting our hands-on with this phone shortly.